On Friday 11 November the 22 Dulwich Hamlet men who paid the ultimate sacrifice during the First World War will be honoured by the laying of wreaths and the observance of two minutes silence. Supporters of Dulwich Hamlet are invited to the brief service that will take place at the War Memorial in the boardroom at Champion Hill at 7:00pm. Another incentive to come along will be the showing of the England v Scotland World Cup Qualifying match afterwards in the club bar. This match is quite poignant as each team will be wearing black armbands with poppy images on them in spite of FIFA’s threat of a fine or points deduction. 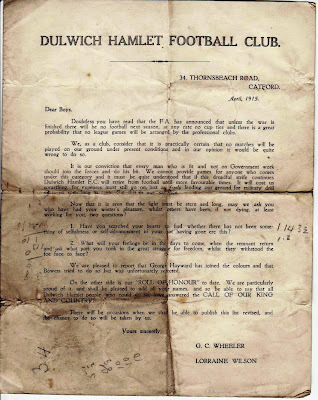 As a timely reminder our friends at the Dulwich Hamlet Supporters’ Trust recently received a copy of a DHFC official letter dated April 1915. 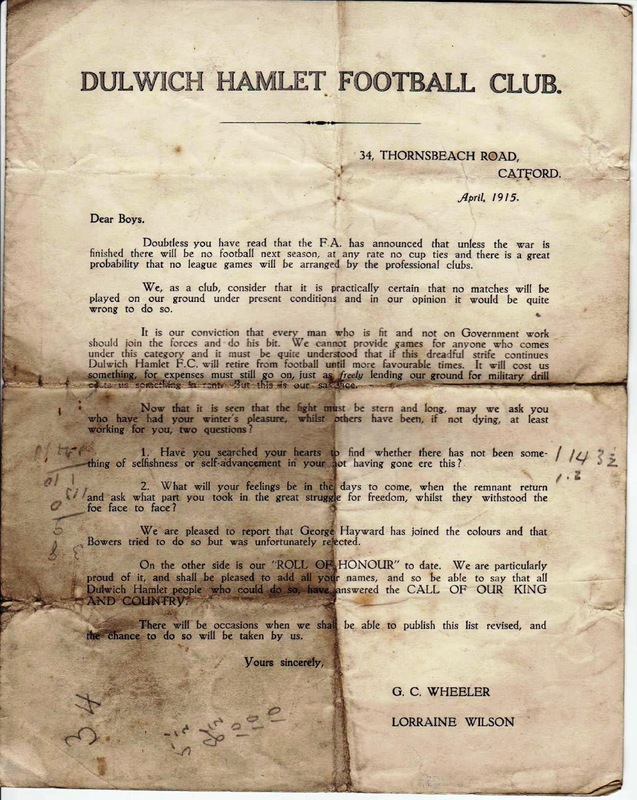 It was sent by George Wheeler and Pa Wilson encouraging the players (and supporters?) to join up to serve their country. Doubtless you have read that the F.A. has announced that unless the war is finished there will be no football next season, at any rate no cup ties and there is a great probability that no league games will be arranged by the professional clubs. We, as a club, consider that it is practically certain that no matches will be played on our ground under present conditions and in our opinion it would be quite wrong to do so. It is our conviction that every man who is fit and not on Government work should join the forces and do his bit. We cannot provide games for anyone who comes under this category and it must be quite understood that if this dreadful strife continues Dulwich Hamlet FC will retire from football until more favourable times. It will cost us something, for expenses must still go on, just as freely lending our ground for military drill costs us something in rent. But this is our sacrifice. Now that it is seen that the fight must be stern and long, may we ask you who have had your winter's pleasure, whilst others have been, if not dying, at least working for you, two questions ? 1. Have you searched your hearts to find whether there has not been something of selfishness or self-advancement in your not having gone ere this ? 2. What will your feelings be in the days to come, when the remnant return and ask what part you took in the great struggle for freedom, whilst they withstood the foe face to face? We are pleased to report that George Hayward has joined the colours and that Bowers tried to do so but was unfortunately rejected. On the other side is our ‘ROLL OF HONOUR’ to date. We are particularly proud of it, and shall be pleased to add all your names, and so be able to say that all Dulwich Hamlet people who could do so, have answered the CALL OF OUR KING AND COUNTRY. There will be occasions when shall be able to publish this list revised, and the chance to do so will be taken by us.